Making your own jewelry is as fundamentally rewarding as it is lovely to wear. Most people associate decoupage with furniture or pottery, but the technique translates well into some very creative jewelry. 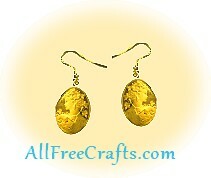 The following article discusses how to make simple jewelry using the decoupage craft method. The basic supplies required for decoupage jewelry include sheets of chip board, scissors, decoupage sealer (that also doubles as your adhesive), and pretty paper. Various jewelry findings will also be needed to finish off your pieces and make them into true jewels; these include items such as jump rings, chains, hooks, pin backs, etc. A pin or pendant is probably the easiest item to create. For instance, find an image you like on thin paper – glossy wrapping paper works well. This could be almost any image, from avant-garde designs to sentimental Victorian cherubs or rosebud bouquets. Cut your chip board to the size of your pendant-size image. Glue your image with the sealer to the chip board. Paint the back of your chipboard red or some corresponding color so the piece will look finished from front to back. When the paint is dry, give the back a coat or two of sealer allowing each layer to dry before applying the neck. The front of the piece may require more than simply your cut-out bouquet. A nice touch would be to frame it with a very thin border of gold foil, but you can make a frame from any paper. Now, give the whole front of the piece about three coats of sealer. Since this is going to be worn against the skin, be sure to use a non-toxic decoupage sealer (most available from the craft store will be non-toxic). Lacquer is also used to coat a decoupage project, but since it is not a non-toxic product, avoid it for jewelry projects. When the front is dry, you can glue on your pin pack then place and wear it. For charms, earrings and pendants, you simply vary the size of your item and poke a hole in each piece for a jump ring to fit. When complete, the jump ring can be attached to a chain or bracelet sporting your new charms or pendant. Some great images for decoupage include traditional cameo pictures, silhouettes, leaves, flowers and butterflies. In the case of the charm bracelet, vary the shapes by using ovals, squares, circles and rectangles. The charms can even be fashioned into earrings by adding fish hook earring wires. Decoupage jewelry also makes some great holiday jewels depicting vintage Halloween or Christmas images.